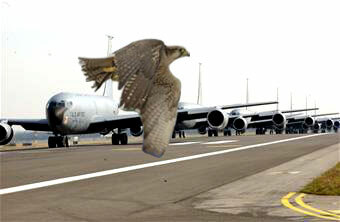 Birds in and around Airports and other sites where the presence of birds can be dangerous. MicroMet�s Avian Detection and Deterrence systems can be used at Airports, space installations, wind farms, military bombing sites, and for bird migratory studies. A truly valuable tool in the fight against risks posed by birds to human activity. BASHRAD� - the MicroMet bird-aircraft strike hazard avoidance radar system is perhaps the most advanced technology available for Bird-Aircraft Strike Hazard (BASH) management, detection and tracking of hazardous bird activity at various sites including civilian and military airports, wind farms, and for environmental and bird migratory surveys. Developed by Radar specialists with decades of Radar experience the MicroMet BASHRAD� Bird-Aircraft Collision Avoidance Radar systems include highly reliable, advanced and proven radar technologies. When used in combination with the proven Bird Deterrence technologies and systems, BASHRAD� offers a comprehensive solution to the problems related to Avian activities. BASHRAD� is available in mobile and fixed configurations to suit all applications. The mobile models are mounted on trailers with all the associated computer equipment installed in the environment controlled trailer cabin. Fully ruggedized for field use BASHRAD� is built for use in harsh environments. The systems can be fully customized to cater to the needs of different applications and customers. Custom and installation specific configurations for both airfield and environmental applications are also available. Systems for use at Airfields can be linked with the bird deterrence systems to provide a seamless solution to bird aircraft collision avoidance. The systems can be used 24x7 to enable active monitoring of the air space in and around the installation site. MicroMet�s BASHRAD� comes with options to include full severe weather monitoring and intrusion detection for security applications. The data display readouts can be delivered to end users like bird control officers and the ATC using the standard off the shelf wireless or landline network technology. The systems can be remotely controlled using the various networking technologies.